Contact Quality Auto Center today for information on dozens of vehicles like this 2011 BMW M3 CARFAX Certified 1 Owner - No Accidents - Fully Serviced - QUALITY CERTIFIED up to 10 YEARS 100,000 MILES WARRANTY - 4.0L V8 S/C 414 HP - Hard Top Convertible -. This BMW includes: PREMIUM PKG Universal Garage Door Opener Bluetooth Connection Telematics Power Folding Mirrors BMW ASSIST Bluetooth Connection Telematics TECHNOLOGY PKG Keyless Start Engine Immobilizer Navigation System Power Door Locks Keyless Entry Active Suspension ANTI-THEFT ALARM SYSTEM Security System COLD WEATHER PKG Heated Front Seat(s) 7-SPEED M DOUBLE CLUTCH TRANSMISSION Transmission w/Dual Shift Mode 7-Speed A/T A/T REAR PARK DISTANCE CONTROL Rear Parking Aid FOX RED, EXTENDED NOVILLO LEATHER SEAT TRIM Leather Seats CONVENIENCE PKG Keyless Start Engine Immobilizer Navigation System Rear Parking Aid Security System Power Door Locks Keyless Entry Bluetooth Connection Telematics Auxiliary Audio Input MP3 Player *Note - For third party subscriptions or services, please contact the dealer for more information. * Reliability is something you can count on when you purchase a Certified Pre-Owned vehicle like this BMW M3 CARFAX Certified 1 Owner - No Accidents - Fully Serviced - QUALITY CERTIFIED up to 10 YEARS 100,000 MILES WARRANTY - 4.0L V8 S/C 414 HP - Hard Top Convertible -. Every day feels like Saturday when you're driving a well-maintained, plush convertible like this one. The BMW M3 CARFAX Certified 1 Owner - No Accidents - Fully Serviced - QUALITY CERTIFIED up to 10 YEARS 100,000 MILES WARRANTY - 4.0L V8 S/C 414 HP - Hard Top Convertible -'s pristine good looks were combined with the BMW high standard of excellence in order to make this a unique find. 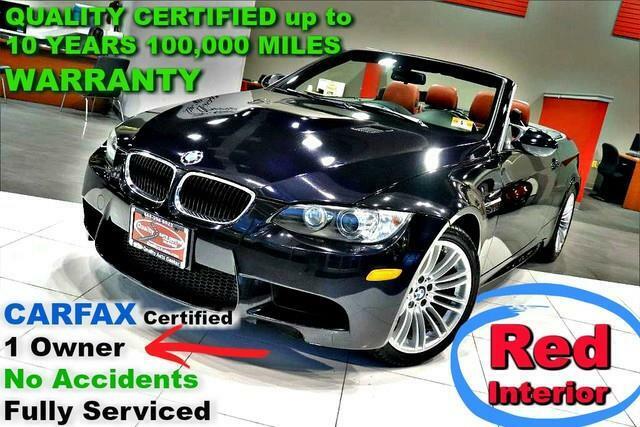 The M3 CARFAX Certified 1 Owner - No Accidents - Fully Serviced - QUALITY CERTIFIED up to 10 YEARS 100,000 MILES WARRANTY - 4.0L V8 S/C 414 HP - Hard Top Convertible - has been lightly driven and there is little to no wear and tear on this vehicle. The care taken on this gently used vehicle is reflective of the 50,577mi put on this BMW. The best part about navigation systems like the one that comes in this car? You don't have to try to fold them up and stuff them back into the glove box. Marked by excellent quality and features with unmistakable refined leather interior that added value and class to the BMW M3 More information about the 2011 BMW M3: The BMW 3-Series is offered in more body styles than any other vehicle in its class, and with coupe, sedan, wagon, or convertible variants, you'll be able to pick the one that fits you best. Across any of these models, the 3-Series has a refined, sophisticated feel combined with excellent steering and handling and smooth, responsive powertrains. Particularly of note are the new 335is Coupe, which combines the 300-hp turbocharged six and DCT transmission for the first time, and the 335d sedan, which can accelerate about as quickly and also returns a stunning 36 mpg highway. At the top of the range is the renowned M3, available in coupe, sedan and convertible form. A performance legend, the M3 represents one of the best performance values on the market today. Strengths of this model include tight retractable hardtop setup for Convertible, nice, well-controlled ride, Several different body styles to choose from, new track-oriented 335is model, great handling and steering, and available clean-diesel engine on Sedan No Credit / Bad Credit / No Paystubs, No problem !! ! All Approved ! Everyone drives ! CLEAN, GORGEOUS, LOW MILES, SHOWROOM CONDITION. CALL NOW QUALITY CERTIFIED up to 10 YEARS 100,000 MILE WARRANTY , To Certify a vehicle, there will be an additional cost for Certification. CALL NOW For details. STUNNING AGGRESSIVE LOOK ON THIS BEAUTIFUL--Call today to schedule a test drive... Good Credit/Bad Credit/No problem!!!! Get paid cash? No problem!! 100% Credit Approval with interest rates starting at 2.49% for qualified customers, our rates will not be beaten. We price our cars at wholesale price to guarantee the best deals for our customers. Our inventory moves quick, please call to confirm the availability of the vehicle of your interest Springfield location 973-564-0112. This vehicle is located at our SPRINGFIELD location. Come visit our new showroom in Springfield NJ.